Dissolve yeast in the warm water and sugar. 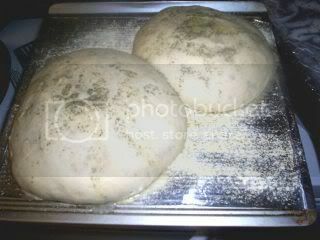 Add flour, salt, and 1-2 tsp Rosemary and stir until blended, do not Knead!! Cover and let rise for 1 hour or until double in size. I keep it in the mixer bowl and cover with a moist cloth to raise. 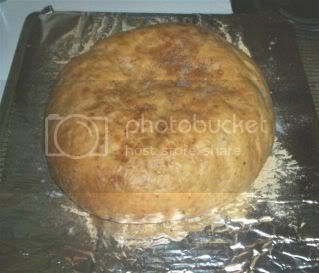 I put my bread in my oven to raise, I turn on the oven light...works wonderful..keeps it warm. Remove dough. It will be sticky. I like to put shortening or oil on my hands for taking out the dough and shaping it. I think it works better than flour hands. Place it in 2 rounds on a cookie sheet lightly coated with Pam and sprinkled with cornmeal. Let it rise another hour. Brush each round with melted butter and lightly sprinkle with more Rosemary and Kosher salt. Bake @ 425 for 10 minutes, then reduce temp to 375 for 15 minutes more. Cool slightly, then cut into nice size bits or rip it apart and dip in a bowl of olive oil and balsamic vinegar. This bread can’t be beat! It is soooo delicious and a really easy bread recipe. If you’ve never made bread before, Rosemary Bread is a great one to start with. 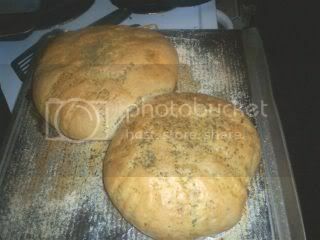 Rosemary Peasant Bread baked and ready to eat...YUMMY !